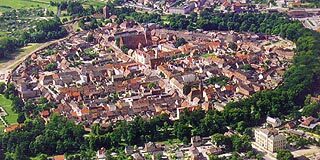 Wittstock is a small town with about 14000 inhabitants in the northeast of Germany in the state of Brandenburg. Slavic people founded the town at the confluence of Dosse and Glinze. The name ‘Wittstock’ is originated in the Slavic language and translates to ‘place on a high level’. 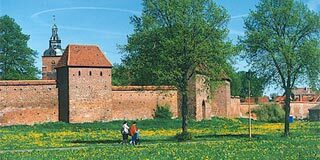 Already mentioned in the founding documents of the diocese Havelberg of 946, the town can look back on more than 1000 years of history. 300 years after foundation the bishops of Havelberg moved their diocese into town and stayed there for further 300 years. Castle and town grounds got expanded. In medieval times Wittstock has been located at the junction of important trade routes. During the 30-year war in 1636 the most bloodiest battle of this war took place in this town. The unexpected outcome was the victory of the outnumbered Swedes under Johan Bauer over the emperor’s army and the Saxons. The ‘Simplizissimus’ by Grimmelshausen placed Wittstock and this battle in literature history. Even today street named like ‘Schwedenpappel’ or ‘Schwedenstein’ remind of that time. In 1681, a time when there were just 70 post stations in Prussia, the so-called ‘Güstrower Geschwinde’ (very fast) started to operate between Berlin over Wittstock to Güstrow. It took until 1885 that the town got connected by train to Wittenberg and 10 respectively 14 years later to Neustrelitz and Berlin. At the turning of the century Wittstock turned into the trade – and school – town of the region Ostpregnitz. In the 1920th the tourism from Berlin to Zechlin and Wittstock started. The landscape as well as the attractions of the town Wittstock / Dosse draw the people. This town is one of few in the former eastern Germany, who has a historic center that still is completely surrounded by an intact town wall. With each step the visitor can discover attractions and interesting things conserved over the times. Lots of romantic Tudor houses can be found throughout the town. Many of those have been built directly after the big blaze in town in 1716. Because of the historic town center and the numerous Tudor houses Wittstock is also called the “märkisches Rothenburg”. Outside the town is a big wooded area, named ‘Wittstocker Heide’, where hikers, biker and horseback riders can find quietness and relaxation. In 1952 Wittstock became center of the district. But it was in the 1970th that the town started to grow by developing commercial growth mainly furniture -, metal – and clothing industries. But the rural character remains intact. 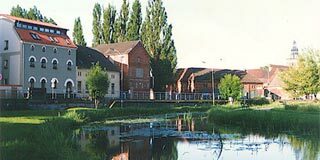 After the structural reorganization of the region in 1992, Wittstock belongs to the district of Ostprignitz – Ruppin. Further information, impressions and history are available through www.wittstock.de in the Internet.